#GazaChat connects the world to Gaza | لماذا غزة؟ Why Gaza? A little known secret must be shared. I never would have had the opportunity I had living and teaching in Gaza (Sept. 2012 – May 2013) if it hadn’t been for the Palestinian friends I made on Facebook during the heady days of the Arab Spring in 2011. My nephew was responsible for setting up my Facebook account in 2007 or 2008 over my initial resistance. I just couldn’t imagine how Facebook might improve the online messaging experience I already had with email. I know some friends in my cohort (50s, 60s and 70s) who refuse to take the leap into Facebook or, if they do, they carefully circumscribe their “friends list” and the online experience. They hope to maintain a semblance of privacy on a very public social media tool. I did just the opposite. I want everything to be public. In the early days, I searched out interesting people (like authors and leaders in different fields) to request their “friendship” on Facebook. One led to another, and to another, until I had a critical mass of “friends”, many of whom I didn’t know personally but I liked their minds. I appreciated what they wrote or posted on Facebook. I knew the downsides of Facebook — the silo effect which might trap me in an echo-chamber of like-minded “friends”; the craziness from the trolls on social media; and the ugliness from obnoxious idiots. Thankfully, I’ve been able to tiptoe around the minefield and avoid most of the traps I’ve been warned about. During the Arab Spring uprising in Cairo in early 2011, a young Palestinian from Gaza reached out to me on Facebook. I don’t know how he found me, but our only connection seemed to be English and a mutual interest in the Arab Spring revolution. When he told me he was from Gaza, my typing fingers started whizzing along on the keyboard, recalling my first visit to Gaza in 2004. I wanted to hear more about his life in Gaza. One thing led to another — as so much with life on Facebook does — and I met more Palestinians in Gaza, and a university professor from Gaza, and then secured an invitation to visit Gaza. Al-hamdulillah! Now I have a Twitter account (although I’ve decided to avoid Twitter since the Tweeter-in-Chief began polluting the airwaves). I’m stepping into the world of Twitterstorms and Twitterchats because I see a glimmer of what the future holds. The benefit of tweeting in 160 characters still seems a bit elusive to me but I’m willing to learn. What new path might this reveal? How does a Tweetchat work? #GazaChat, which we will all be using. remember that you can post your own tweets directly from the search page– and when you do so, Twitter automatically adds the hashtag to your tweet! It is actually easier to refresh the search if you use a mobile device, where you do it simply by swiping down on the screen. Whatever device you use, though, you’ll likely find there’s a time-lag of around 20 seconds between when someone posts a tweet with the hashtag and when it shows up in the search. For the hour of the tweetchat, our hashtag will function as our (globe-circling) chat room! By the way, for most participants, joining the conversation is a text-only experience, so you’ve no need for any fancy internet connections. To help structure each chat, we (@JustWorldEd) will throw into it a series of questions, that we’ve previously prepared on static image-slides for your easy visibility. We’ll post a new question every few minutes, and we’ll number them, Q1, Q2, Q3… They will look like the sample one shown here. We ask chat participants to try to respect the numbering system, which helps to give some structure to what could otherwise be an unruly Twitter free-for-all. When you see a question– or a series of answers to any question– that you want to comment on, discuss, or give an answer to, please preface your answer or other contribution with A1, A2, or whatever the number is of the discussion-portion it’s related to. 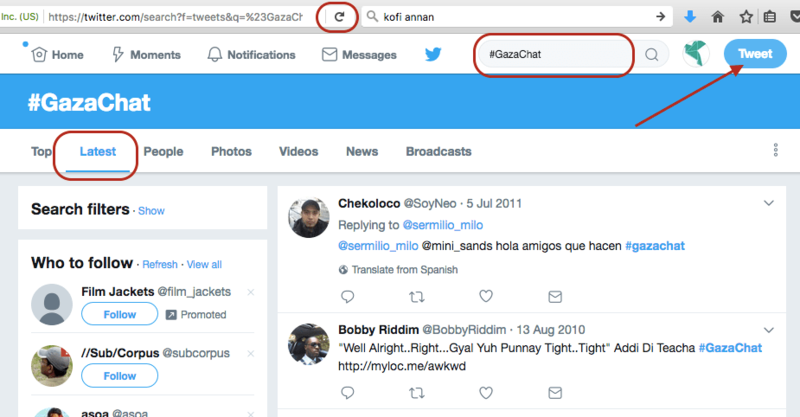 Twitter will then automatically include the #GazaChat hashtag on your answer, if you’re connected via the hashtag search. You’ll need to keep your answers short, of course. But you can certainly contribute more than once to each question. We also ask you to keep your contributions respectful to everyone– and not to hog the discourse completely. Once the discussion on Q1 seems to have run its course, we’ll tweet out Q2… then Q3, Q4, and so on… Stay tuned to the #GazaChat hashtag so you can see and respond to each of the questions as we send them out! I joined the #GazaChat this morning but had a difficult time following it. I’m just not twitter savvy.